Siuslaw sophomore Gracie Freudenthal won both hurdles events, including a 4A state best in the 300. 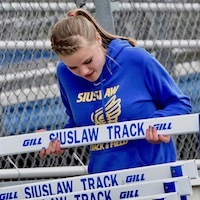 Siuslaw sophomores Brea Blankenship and Gracie Freudenthal posted Class 4A state bests Thursday for victories in the 14th annual Siuslaw Icebreaker track and field meet at Hans Petersen Field. Blankenship ran the 800 meters in 2 minutes, 28.80a seconds, while Freudenthal clocked 48.42 in the 300-meter hurdles. Freudenthal also won the 100 hurdles. The Lady Vikings' third super soph, Andrea Osbon, won the discus with a personal-record 106 feet, 2.25 inches and the shot put at 35-4. Five schools competed, all from different Oregon School Activities Association classifications, including 1A Mapleton, 2A Coquille, 3A Douglas and 5A North Bend.